These new chainrings continue to feature intricate CNC machining to reduce weight without sacrificing performance or strength. 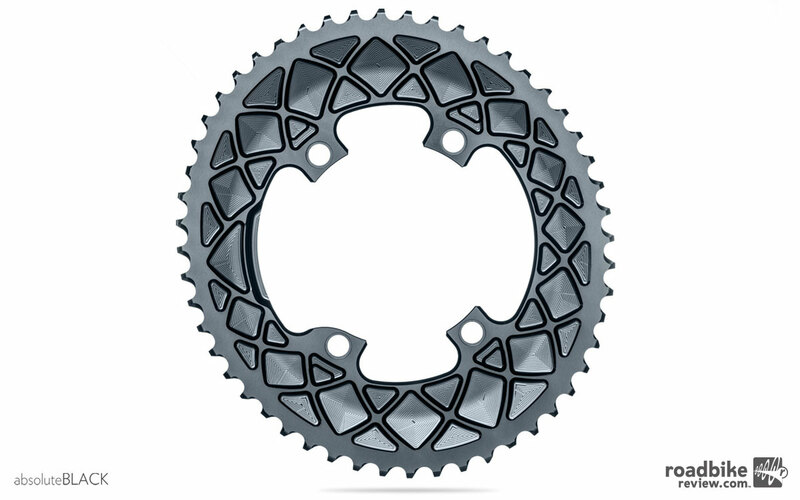 As a manufacturer of chainrings, absoluteBLACK receives requests on a daily basis for unusual chainring combinations such as 52/32, 50/30, or 53/32. But these will not work well due to front derailleur limitations. They also do a poor job of keeping good cadence across both rings. This lack of alternatives from normal set-ups often force riders to over gear. To combat this, absoluteBLACK is launching a range of sub-compact oval chainrings in 48/32 and 46/30 combinations that can be mounted to any 4-bolt Shimano crank. 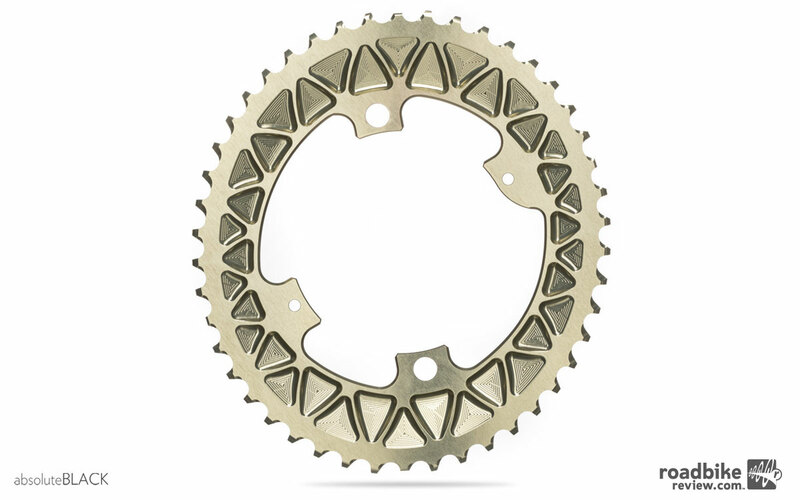 The 30- and 32-tooth inner chainrings can improve cadence and smoothness of pedal stroke while riding long/steep climbs, while 46 or 48-tooth outer rings still allow for high speed spinning. 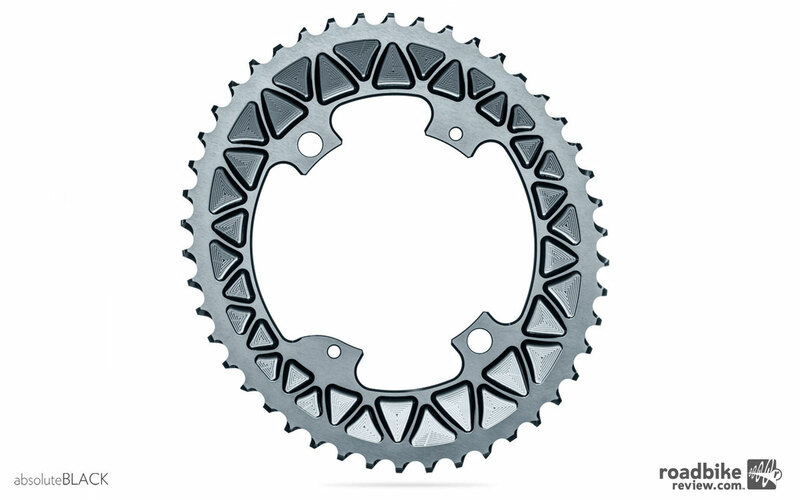 Previously such configurations of sub-compact chainrings were considered impossible to manufacture on regular 110/4bcd crank spiders because 32- or 30-tooth chainring teeth lay below mounting hole circumference. However, thanks to absoluteBLACK’s patent pending offset chainring, it’s now possible. 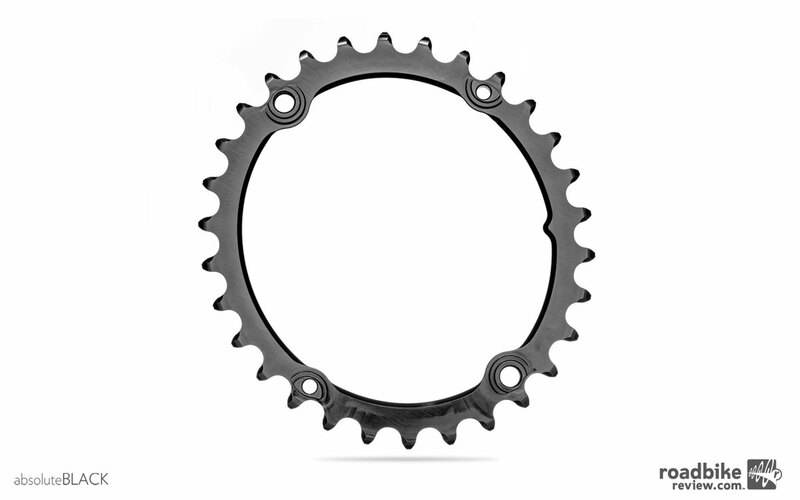 This 30-tooth inner ring makes it easier to spin up super steep climbs. The inner chainring was re-positioned closer to the frame by 2.5mm using small threaded tabs. This allows the chain to freely clear the mounting tabs of the crank. To keep the same distance between chainrings, which is necessary for proper shifting, the outer chainring was moved the same distance using special recesses around the mounting holes. All these offsets on both chainrings and the use of custom bolts makes it possible, and also allows for easy assembly of the chainrings. Another important thing to note is that this solution does not require any modification to the rest of the drivetrain, and delivers an improved chainline for the gears riders use most frequently, theoretically allowing for the drivetrain to last longer. These 48/32 chainrings require the same setup as regular compact chainrings, a 1-1.5mm gap between tooth tip and derailleur cage. The only exception is the “L” bolt, which has to be opened completely since chainrings are positioned closer to the frame. The 46/30 is setup in almost the same way as the 48/32. However, as almost every frame manufacturer hasn’t predicted the use of a 46-tooth chainrings on road bikes, the front derailleur braze-on mount is generally positioned a little higher than is desirable. AbsoluteBLACK advises in this situation to set up the front derailleur as low as your braze-on slot allows. This should leave about 5mm gap from the tooth tip to cage edge. The 46-tooth shifting ramps were specially designed to accommodate such distance, thus front shifting remains crisp and quick, claims absoluteBLACK. Due to precise tolerances, clearances and special design of the chainrings, absoluteBLACK recommends using only Dura-Ace CN-9000 or SRAM Eagle 12-speed chains. Both of these can be used in 10- or 11-speed drivetrains and result in quiet and precise shifting. These new chainrings are sold separately, but meant to be only used as combinations of 46/30 and 48/32. No other chainring combination is possible due to specifics in the chainrings design. Prices for the 46 and 48-tooth are $124. The 30 and 32-tooth run $87.50. Also new are absoluteBLACK’s just launched premium oval road 2X chainrings made specifically for Shimano Dura Ace 9100 and Ultegra 8000 road cranksets. 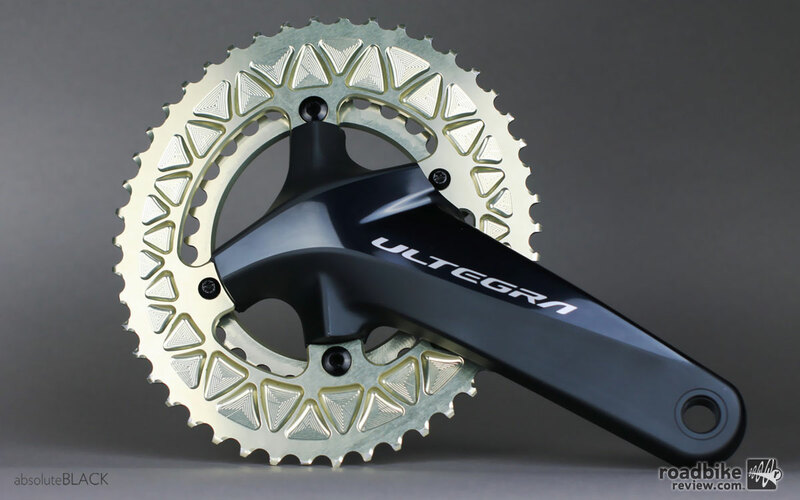 They are also compatible with previous Shimano Dura Ace 9000 and Ultegra 6800 series cranks, which share the same 110mm BCD/4 arm specification. 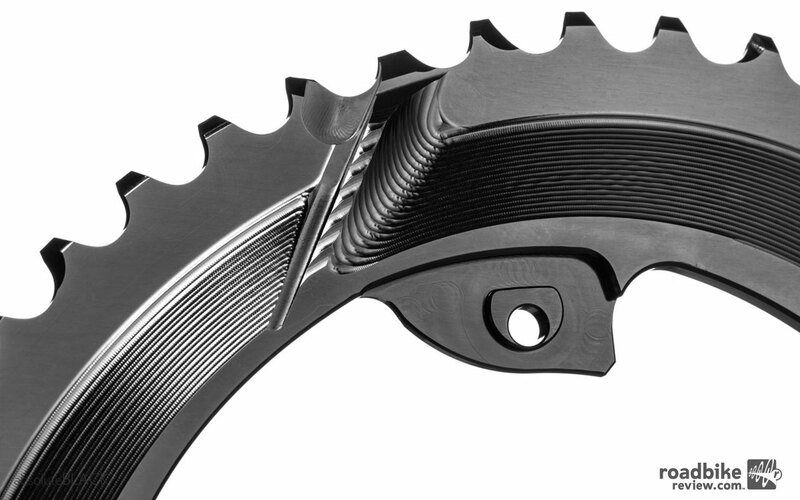 Now you can run absoluteBLACK oval chainrings with the newest Shimano drivetrains. These new chainrings continue to feature intricate CNC machining to reduce weight without sacrificing performance or strength. They also feature an improved integrated ramp design. The new CNC machined ramp profile has proven, through heavy testing, to deliver faster and more precise front gear shifting performance than previous iterations. The premium oval road outer rings are available in black, grey and a new champagne color. The premium inner rings are available in black only. Available ring sizes match current trends for lower gearing. The premium oval road outer rings are available in black, grey and a new champagne color. Finally, while not completely necessary for full function, absoluteBLACK recommends fitting an additional CNC machined aluminum bolt cover to create the smooth ‘flush fit’ appearance between the Shimano 9100/8000 crank arms and their premium oval road rings. The CNC machined bolt covers cost $52 and are available in either black or grey. The new 46-tooth shifting ramps were specially designed to accommodate great distance from the front derailleur, thus front shifting remains crisp and quick. Let’s see the Campy and SRAM models.